Do you feel like you’re throwing your money down the drain when it comes to Google Ads? 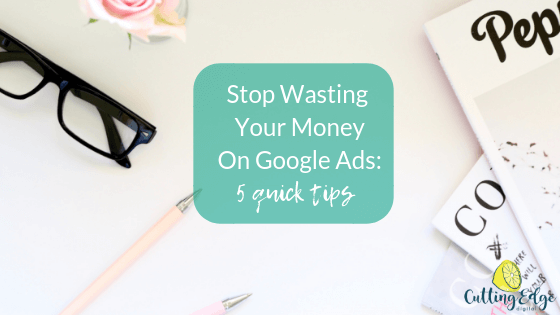 Stop wasting your money on Google Ads with these 5 quick tips now! If you don’t know what you’re doing when it comes to Google Ads, Google likes to tell you to start with AdWords Express. Supposedly it’s a platform that means anyone can set up and use Google Ads. While this may be true from a setup point of view, it’s really a false economy. AdWords Express is very limiting in the type of campaigns you can run, and often I see ads appearing for all sorts of random search terms that have nothing to do with the business. So, if you don’t want to waste your money on Google Ads, skip AdWords Express and go straight to Google Ads. By far the most rookie mistake I see when reviewing Google Ads campaigns relates to keyword match type. When you add new keywords in Google Ads, it automatically makes them broad match. This is because other match types – phrase and exact – require extra punctuation. Broad match keywords mean that your ads can appear for any of those words (or variations of those words), in any order, and combined with ANY OTHER words. So if you’re bidding on the term ‘Italian restaurant Perth’, and you’re using broad match, your ad could appear for searches like ‘worst restaurants in Perth’ or ‘Indian restaurant near me’. Avoid broad match like the plague. If you want to add phrase match keywords make sure they are in “quotation marks” like that. If you want to add exact match keywords, they need to be in [square brackets] like this. Another default Google Ads campaign setting is including the search network and the display network in one campaign. If you think you’re running a search campaign, head into your campaign settings and check if it is set to ‘Search Network Only’ or ‘Search Network with Display Select’. Search network with display select means your ads can not only appear when people search on Google, but also randomly as text ads across the display network. Display ads are much less engaged with the search ads in general, so to avoid skewing your stats, only use one network in each campaign. And always max out your search budget before running a display campaign! Often when building a new campaign, the default location will be set to your country. But if you’re a local business operating just 25km around your business address in Sydney, there’s no point advertising to anywhere else in Australia. You can set your location targeting by country, state, city, suburb, or by a radius, either in kilometres or miles. This is much more effective if your ideal target market is in a specific location or locations. How do you know if you’re really wasting money on Google Ads? You need to know what’s converting into leads or actual sales before you can say you know it’s a waste of money. But so many accounts I review aren’t set up to track conversions at all. If you’re an e-commerce business you can activate e-commerce tracking in Google Analytics and then import that goal to Google Ads. It will then show you exactly how many sales you’ve had and what the sale value was. Alternatively, you can add Google Ads conversion tracking code to the final check out URL. For other websites you should be tracking things like completed contact forms, calls from clicks on phone numbers in your ad and clicks to call on phone numbers on your website. These 5 quick changes to your Google Ads could help you stop wasting hundred, or potentially thousands of dollars on Google Ads. If you’d rather get a pro to set up and manage your Google Ads, I’d love to chat! As a freelance digital marketer in Perth, I can help you with Google Ads set up and management for your business.